1-1/4 in. Size PVC Fittings and Pipe | FORMUFIT - Buy Online — Tagged "Type: 45 Degree"
FORMUFIT 1-1/4 in. Size PVC is the ideal size for most structural projects. Known as the ‘Goldilocks size'; 1-1/4 in. PVC is ‘not too big’ and ‘not too small’. This makes it ideal to manufacture durable furniture applications without much bulk. Since it is very rigid, 1-1/4 inch PVC works well to create patio furniture, pool ladders, beach carts and storage shelves. 1-1/4" Size is the most diverse FORMUFIT product line. This size has extra accessories, such as Caster Pipe Caps, Ball Caps and Jump Cups to make your project complete. All FORMUFIT 1-1/4 in. 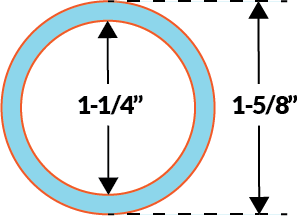 fitting products work with 1-1/4 in. Schedule 40 PVC pipe, which has an outside diameter of 1-5/8” (1.660 in. ).